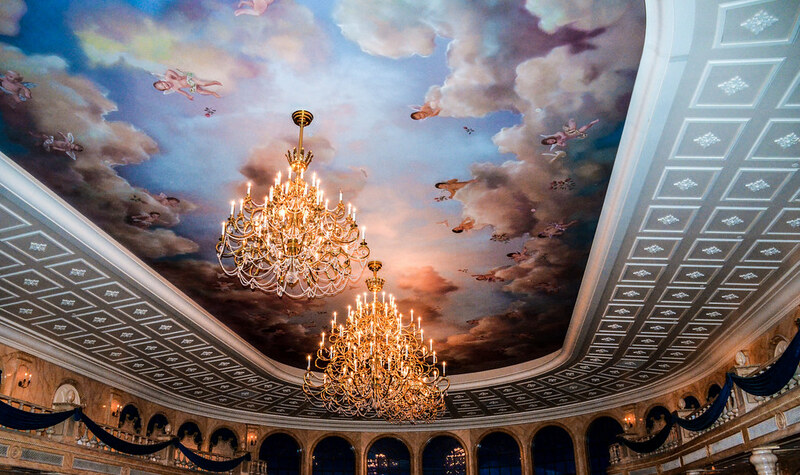 Be Our Guest is a restaurant residing in Magic Kingdom’s Fantasyland. 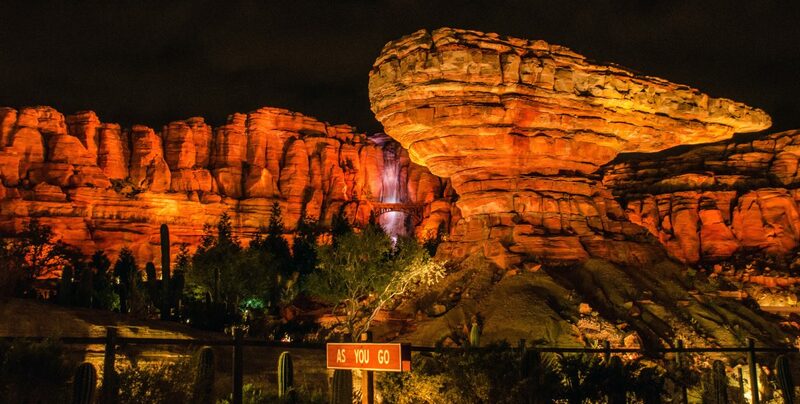 A table-service restaurant at night, Be Our Guest acts as a counter-service restaurant for breakfast and lunch. We already have reviews of both lunch and dinner at this restaurant (follow the links) so it seemed time to complete the trifecta and review breakfast. If they start offering fourth meal then you know we’ll be there. Nearly every day Be Our Guest Restaurant opens at 8 AM, typically a full hour before Magic Kingdom opens. Ending service at 10:30 AM, breakfast is definitely the least popular meal at Be Our Guest. Same day (or night before) reservations are regularly available here for breakfast instead of guests having to wake up at the crack of dawn 180 days before their trip to make a reservation, which is the case for lunch or dinner. If planning a trip on short notice, breakfast is the best option to be able to see Be Our Guest Restaurant. Unfortunately, I don’t think it’s a good option. Be Our Guest is no less beautiful in the morning as any other time of day. Just being in the restaurant itself is a wonderful experience. All rooms (West Wing, Grand Ballroom, and Castle Gallery) were open for breakfast. I’ve now dined in all 3 and prefer the West Wing. On this morning, we were in the Castle Gallery. If the West Wing is all full, this would be my next choice of where to sit. The room is a little more unique than the ballroom and I like the paintings. Along with the beautiful rooms, breakfast at Be Our Guest does have a more relaxed setting. The restaurant is still busy but doesn’t nearly have the same hustle and bustle as lunch. As for the menu, weirdly everything is priced at $28 on the adult menu. A Crossaint Doughnut costs the same as a breakfast sandwich or a Quiche. Why? I have no clue. All options come with pastries but that doesn’t seem to be reason enough to price everything the same. The menu has a decent variety for being a “counter-service” breakfast location. Here’s a look at the pastries. I really liked the muffin and danish. Melissa’s favorites were the cinnamon roll and chocolate croissant. Everything here was good but nothing amazing. There was also too much here for 2 people. Maybe lower the price and serve less food? 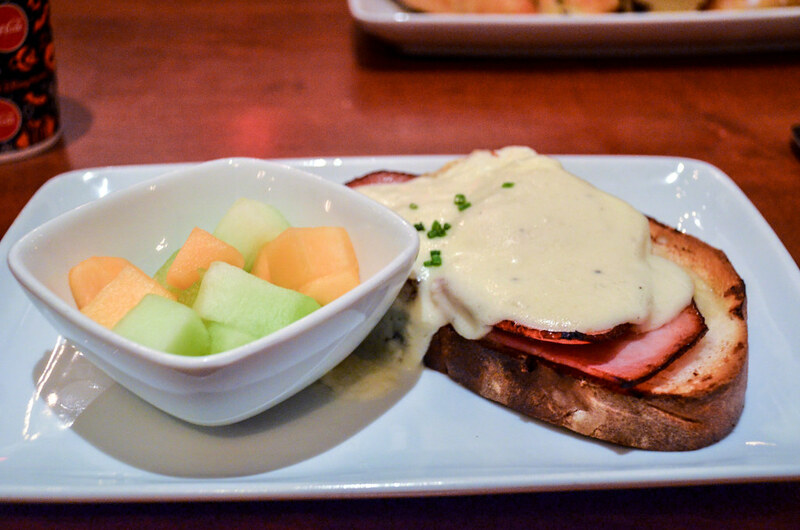 I ordered the Croque Madam and enjoyed the meal. The ingredients all really complimented each other and were prepared well. The ham was the best part of the sandwich, with a smokey flavor. The sauce on top (Bechamel) tied the sandwich together with a taste similar to gravy. My sandwich was served with a fruit cup and it was lacking a variety of fruit and quantity. Sorry about the lousy photo. Melissa ordered the The Open-Faced Bacon and Egg Sandwich. This was also quite tasty with poached eggs and some quality bacon on a flaky croissant. The arugula didn’t add much but it also didn’t hurt the sandwich. She received more fruit than I did but it was still just Honeydew and Cantaloupe. 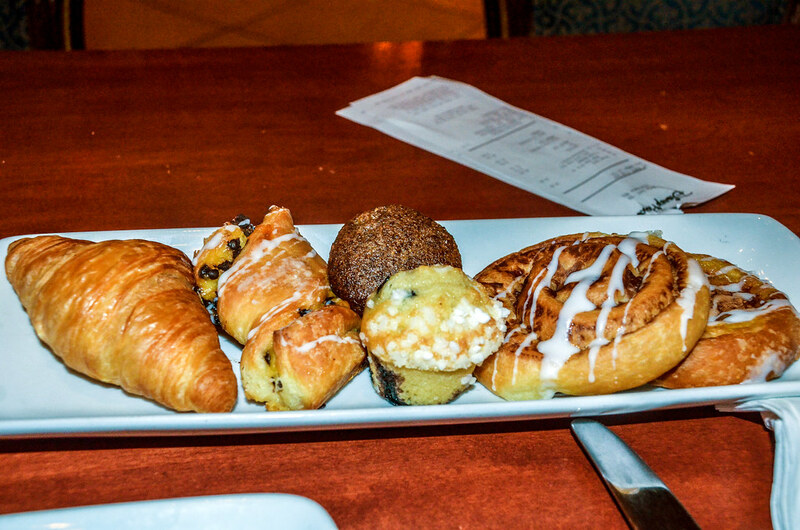 All of the food we tried at Be Our Guest’s breakfast was well-prepared and delicious. No, these weren’t elaborate or extremely creative breakfasts but quality (and hearty) sandwiches. The meal is a little heavy on pastries but after all, this is France! 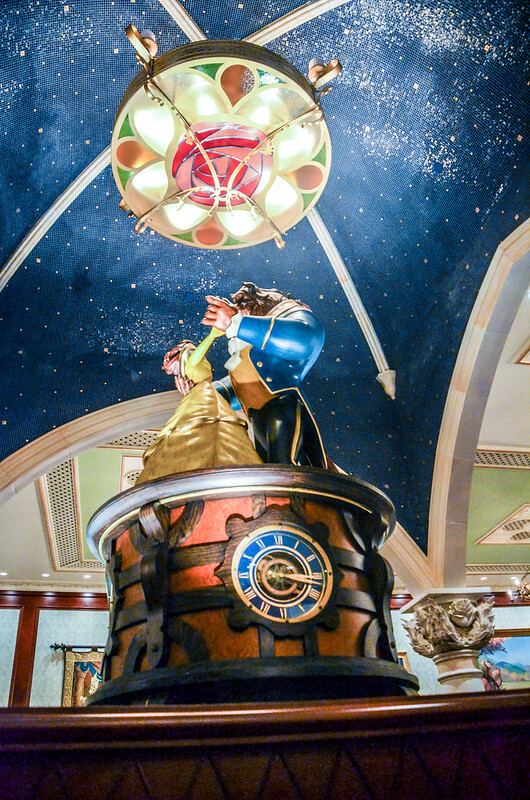 Even with the good food, I can’t recommend Be Our Guest because of one issue – the price. Frankly, $28 is just too much for breakfast. Especially when that breakfast is counter-service. 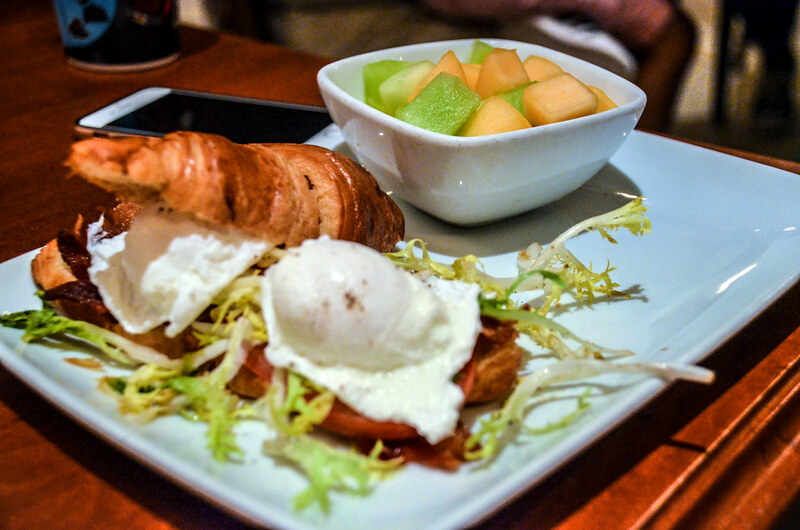 Throughout Disney World, breakfast is one of the better ways to get a decent value out of a meal. Just a short monorail ride away, Kona Cafe offers breakfasts that are better reviewed, more creative, while being a sit-down meal with entrees that are $15 (or less) instead of $28. Boma, Animal Kingdom Lodge’s excellent buffet restaurant, offers a far more original breakfast buffet just under $30. These two meals aren’t comparable and yet their price is the same. Even Tusker House, in a character dining buffet in Animal Kingdom, is only $30. Point being, table-service restaurants are a much better value than this counter-service restaurant and buffets are only slightly more expensive but a lot more interesting. The one caveat here is if you are on the Disney Dining Plan. We still prefer lunch at Be Our Guest and would recommend it over breakfast setting price aside, but $28 for a counter-service meal is a really good value on the Dining Plan. It’s also much better food than what you’d find at other counter-service breakfasts. For those that can’t find a lunch reservation and are on the dining plan, have an early morning reservation at Be Our Guest’s breakfast. I have no idea why Be Our Guest is charging so much for breakfast other than they know suckers like me will eat their once before realizing the rip-off it is. The only way I’d recommend going here is if you’re on the dining plan and can’t get a lunch reservation. I prefer the food at lunch more to this and it’s half the price. Even dinner’s cost is not much more than what you’re paying here. 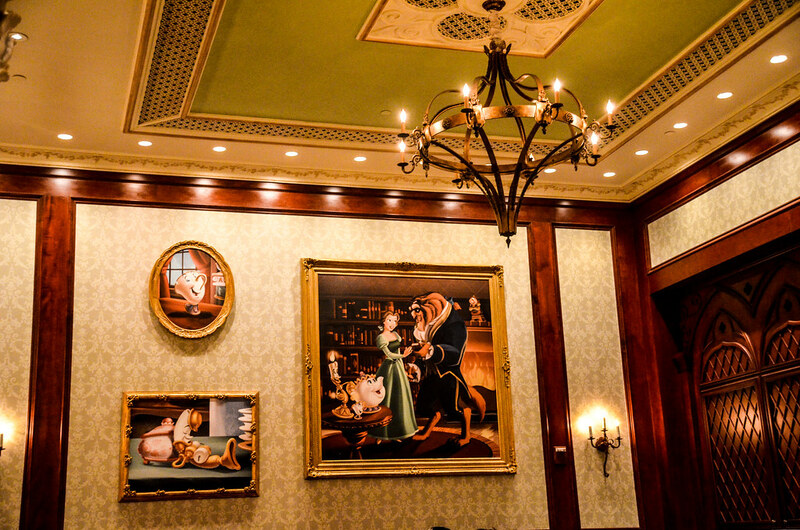 Be Our Guest’s breakfast offers good food in a beautiful building but is simply one of the worst values on property, because of that I do not recommend it. Have you been to Be Our Guest Restaurant for breakfast? Let us know any questions or thoughts in the comments! Thank you for reading Wandering in Disney. If you like what you’re reading then please follow us on social media and subscribe to the blog. You can do both of those things on the right side of this page. Have a great day! For what it’s worth, I could not recommend lunch at Be Our Guest more. One of the top counter-service meals in all of Disney World.